In this important new book, Jürgen Habermas takes up certain fundamental questions of philosophy. While much of his recent work has been concerned with issues of morality and law, in this new work Habermas returns to the traditional philosophical questions of truth, objectivity and reality which were at the centre of his earlier classic book Knowledge and Human Interests. How can the norms that underpin the linguistically structured world in which we live be brought into step with the contingency of the development of socio-cultural forms of life? How can the idea that our world exists independently of our attempts to describe it be reconciled with the insight that we can never reach reality without the mediation of language and that 'bare' reality is therefore unattainable? In Knowledge and Human Interests Habermas answered these questions with reference to a weak naturalism and a transcendental-pragmatic realism. Since then, however, he has developed a formal pragmatic theory which is based on an analysis of speech acts and language use. In this new volume Habermas takes up the philosophical questions of truth, objectivity and reality from the perspective of his linguistically-based pragmatic theory. The final section addresses the limits of philosophy and reassesses the relation between theory and practice from a perspective that could be described as 'post-Marxist'. This volume, now available in paperback as well, by one of the world's leading philosophers will be essential reading for students and scholars of philosophy, social theory and the humanities and social sciences generally. Jürgen Habermas is Emeritus Professor of Philosophy at the University of Frankfurt. 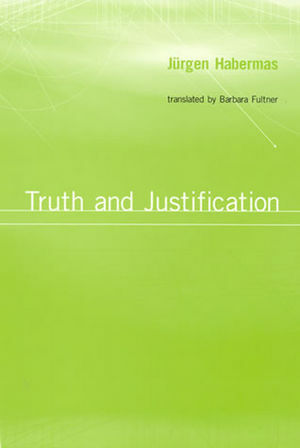 In this new work Habermas returns to the traditional philosophical questions of truth, objectivity and reality. Habermas pursues these questions from the perspective of his own formal pragmatic theory which is based on an analysis of speech acts and language use. He asks: How can the idea that our world exists independently of our attempts to describe it be reconciled with the insight that we can never reach reality without the mediation of language? Addresses the limits of philosophy and reassesses the relation between theory and practice from a ‘post-Marxist' perspective.